Well, I’m still thinking I don’t like my photographer very much. Although – maybe if I used a better camera (these were taken with my cell phone), it might make a little difference. Before, it was just too beefy for my taste. After, it looked more like a finished wine rack, and I’m pretty pleased with the results. Finished with one coat of cabernet stain, two coats of shellac to seal it, and three coats of Minwax hand rubbed gloss poly. After it cures overnight, I’ll apply a coat or two of Trewax bees wax, and it’s done! Great looking wine rack. What is the over all size? About 1 1/2 ft wide by about 2 ft tall by about 4 inches thick. 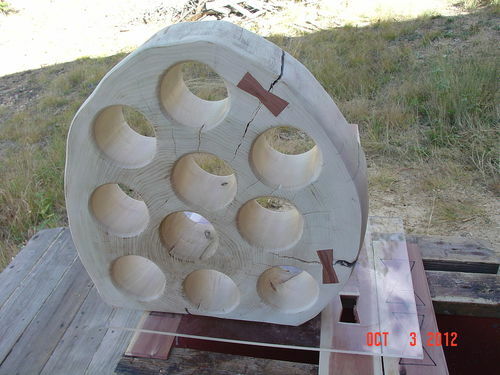 The holes were drilled using a 3 1/2 inch hole saw from both sides. 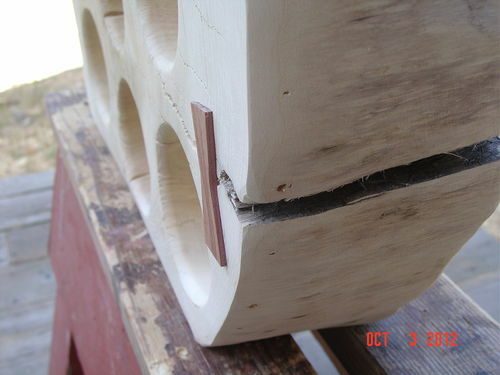 I’m thinking there has to be an easier way and am considering using Diablo 1/2 inch 2 inch long straight bits after making the first pass with the hole saw. Edited to add: Actually, I just went and measured it. 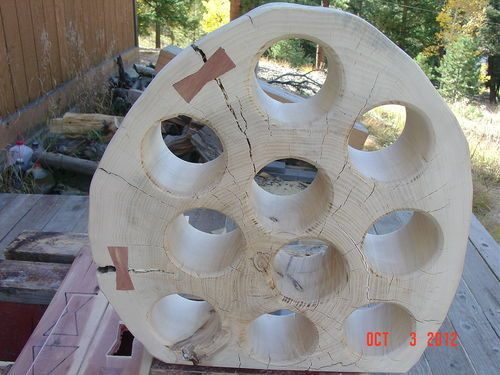 It’s 16 inches wide at the widest point, and is 18 inches tall at the highest point. I swear I didn’t lie about the thickness! Very nice job of adding shape—great looking end result. Very cool idea I love the look. I really like the fact that you used cottonwood. Most people would throw it away because it’s too difficult to work with. Saw this on Facebook and “liked” it. What is the hand pump for? 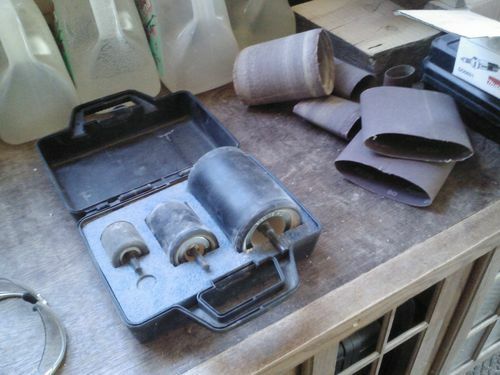 To blow up the sanding bladders or just to blow dust away? The wine rack is a piece of art!!! 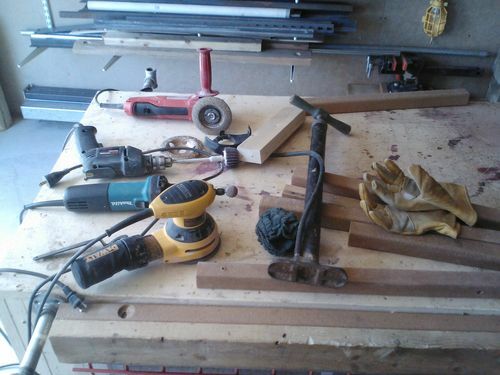 Monte, I actually like the challenge of working with cottonwood. It’s easy to cut and shape because it’s so soft. The finishing is the hardest part. I never seem to be able to get a really smooth finish even after waxing it. But the grain is usually pretty stunning overall. If I remember (I’m gettin’ pretty old, don’tcha know), I’ll try to post a picture of my cottonwood “stash” in this thread. A few years back there was a straight line windstorm in the Denver metro area that took out a lot of cottonwood trees. I was fortunate enough to be able to salvage some of it. jaykaypur, the hand pump is for the bladders as you suspected. I found my air compressor came awfully close to blowing them up one too many times. So I’ve gone to using a hand pump – not as much chance of an explosion. And, thanks, everyone, for your positive feedback. What can I say besides…Wow”? Cottonwood does have some amazing grain. I like the color. Needs more bottles of wine though. 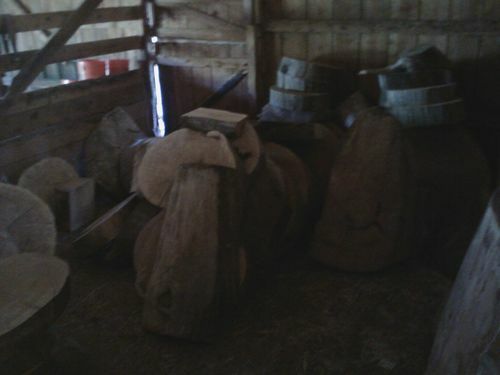 And, true to my word, here is my stash of cottonwood (I apologize for the darkness – these slabs are in the barn out of the weather and it’s dark in there). There used to be a bunch of really big logs, but the slabs in this picture are pretty much the end results of a lot of work with the chainsaw. Very cool…I agree with your thoughts on the revised design, I like the carved shape better too…buuuutttt…..it looks like you had to carve away the butterflies….dang….I really like the look of butterflies and cracked wood, I wish you could have kept one in there! p.s., I really like the table in the background of the third picture, great job! !